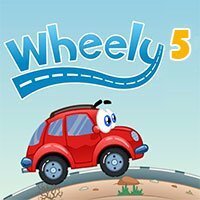 Wheely 5: Wheely is back in the fifth installment of this fun point and click adventure game featuring a red car. This time wheely is a family man, so one of his duty is to mow the lawn of his house, but his lawn mower suddenly broke down after hitting a large rock. Now wheely need your help to fix his lawn mower.